CHAMPIONS…The Lady Warriors swept the playoffs and claimed the 2018 Class B State Championship Title on Saturday! Pictured, back: Coach Leah Beer, Kenedie Walker, Coach Cory Wilson, Jolie Walker, Bristin Bashaw, Kendyll Harris, Emily Moore, Alison Moore, Tiela Johnson, Addison Walker, Maylee Chaney, Byron Cole. 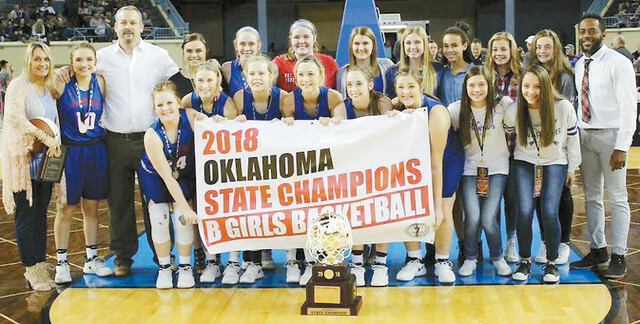 Front: Kaylee Harris, Morgan Miller, Meghan Morton, Adysen Wilson, Avery Wilson, Halee Morris, Harlee Benkey and Mariah Espinosa. It’s the best time of the year. It’s small school basketball Championship Saturday and you have made it to the Big House!